So as I mentioned, my local gun store/range has started offering an expanding suite of training classes. I was offered the chance to audit a couple of them recently, ostensibly in exchange for publishing reviews on my blog, but also because they wanted my feedback on the curricula, class structure, and so forth. 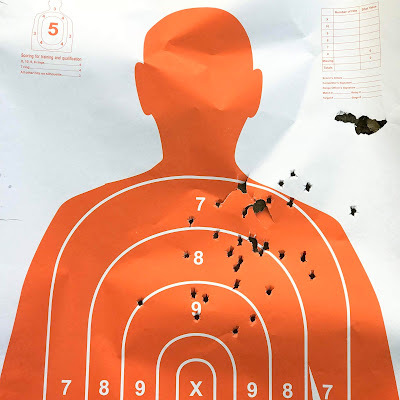 So I took the eight hour Fundamentals of Armed Self-Defense class a couple Saturdays ago and followed it up with the four hour Introductory Self-Defense Shotgun on Wednesday. I'll put up reviews of both classes here shortly...especially since I'll have nothing but time on my hands for at least the next couple weeks...but there was something else I noticed that was worth writing about. It involves a pretty common misconception people have about self-defense, and specifically self-defense with shotguns. 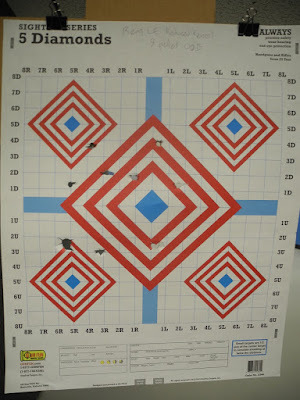 There was a dude in the Saturday class who was obviously not your typical gun hobbyist. He didn't even strike me as the sort of person who's always had guns around and just decided to get some formalized training in the legalities and practicalities of self-defense. Years of working in the retail gun biz have given me a pretty good nose for the customer who has suddenly decided they need a gun because of some news story or incident that hits too close to home. This was that guy. The first half of the class was all state-specific legal stuff, and the guy didn't seem much interested in anything but the Castle Doctrine stuff and laws pertaining to defense in the home. It was soon obvious that he didn't intend on carrying a gun, but was more worried about someone breaking in. During the latter half of the class, which covered more practical stuff, as well as dealing with law enforcement in the aftermath, he was more interested and asking questions. When the effectiveness of the shotgun vis a vis handgun ammunition was being discussed, he looked almost relieved, although he seemed a little taken aback when it was mentioned that even errant buckshot pellets will travel through a number of residential walls and the safest backstop was the bad guy. Sure enough, Wednesday night I showed up to the introductory scattergun class, and he was enrolled in that class, too. 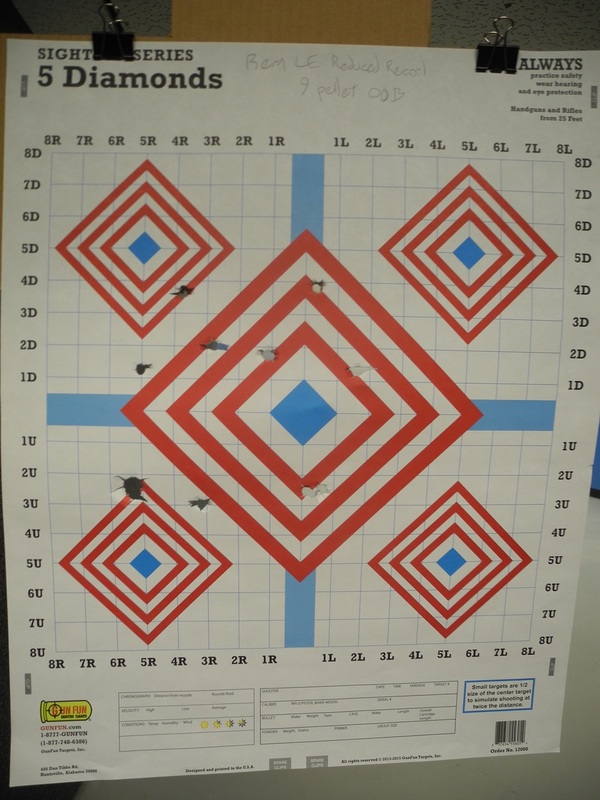 A few more facts came to light by his questions and reactions during the classroom portion of the class, where the effectiveness of various loadings was discussed, as well as the effect of choke and load choice on pattern size. The loosest patterning buckshot I've tried out of my 20" 870 is Remington 9-pellet LE Reduced Recoil, which will still put them all on a pie plate at thirty feet. 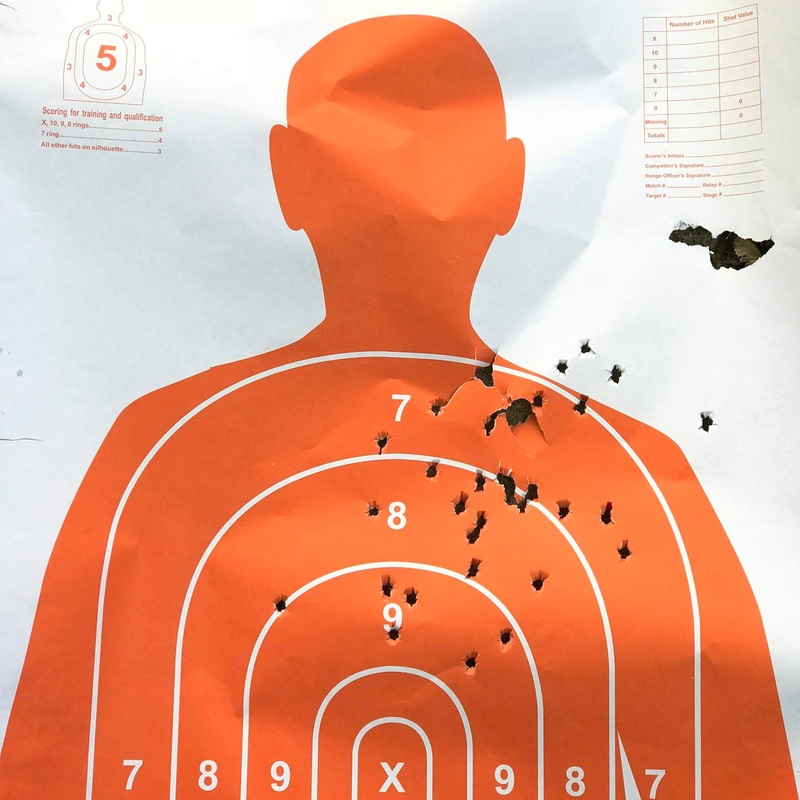 The student had, it seemed, shot 3 Position Smallbore Rifle in college, and remembered the difficulty of hitting the tiny bullseye at 25 yards. Because of this, he had wanted a defensive weapon he wouldn't have to aim under stress. Further, due to medical issues, he wasn't able to raise his right arm above shoulder level or effectively shoulder a shotgun. He'd been sold a shotgun as a weapon that could be fired from the hip and sweep a room or hallway clear with a devastating wall of lead that would knock intruders from their feet, all without having to aim under the stressful conditions of having an intruder in the house. He didn't stick around for the range portion of the class. Tony, our instructor, was willing to work with him using the vintage "underarm assault position", once taught as the right way to run a shotgun, but it would probably require more one-on-one time to do so than the class structure would allow. Oh, put a sock in it, Diamond. "Heavy is good, heavy is reliable..."
The word "problematic" is triggering.